For timeless sparkle that will never go out of style, choose diamond stud earrings. This pair of brilliant-shaped stones gleam in a secure 4-prong setting and will remain secure with friction-back style posts. The diamonds reveal a very-good cut that shows off their brilliant sparkle. With H-I color and I1-I2 grading, these diamond studs make up 1/2 cttw. 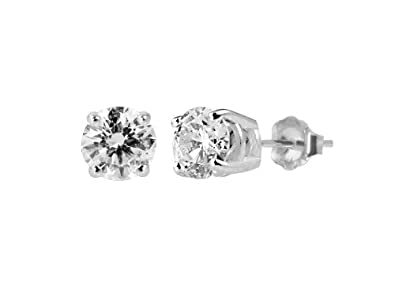 Its a limited time offer – Get 57% off 14k White Gold Round Diamond Stud Earrings.